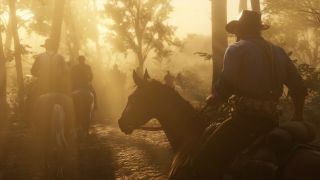 You don't have to progress far into your Red Dead Redemption 2 journey before you're presented with a steed of your own, which is handy as there's really no better way of getting around the huge area you'll be exploring. The thing is, although this starter horse is lovely and all, it's not exactly the Red Dead Redemption 2 best horse - it doesn't have great speed and its stamina is lacking, which means long journeys across the Red Dead Redemption 2 map can become quite arduous affairs. The good news for you is that the Red Dead Redemption 2 best horse is out there just waiting for you to claim it, but first you'll need to learn a few things about breaking horses. This equine marvel can be hard to track down, and once you locate it you'll still have your work cut out to tame it, so make sure you're ready. It's absolutely worth putting in the effort though, as once you're done you can proudly ride around the West in the saddle of the best horse in Red Dead Redemption 2. First off, you have to make sure you’ve unlocked the stables. This is early on in the game, a reward for completing the Chapter 2 mission “Exit, Pursued By A Bruised Ego,” where you hunt a Legendary Bear with Hosea. Once you’ve done that, you’ll find out that the best horse breed in Red Dead Redemption 2 you can purchase is an Arabian. They are always the most expensive when you’re shopping at a stable, averaging around $1000, and offer excellent speed, acceleration and handling. However, there is also a wild variant of this breed, the White Arabian, that has better overall stats. Fortunately, you can acquire this horse for free, as long as you’re ok with going through the arduous process to tame it. But that’s what we’re here for! The White Arabian is an elusive creature that hides out in the tundra of the West Grizzlies. It’s white coat masks the horse amidst snowstorms, making it particularly hard to spot. Put on your best Winter Gear to mitigate the weather so you have enough stamina and health to tame it, and head to the western bank of Lake Isabella, as marked on the map below. I’d recommend you dismount a good distance away from the spot marked below so that your current, inferior horse doesn’t scare the White Arabian and make it bolt. At this point, you should save your game manually to make sure you have an instance to return to if you mess up. It’s very easy to put a foot wrong and lose the horse, and it’s currently unconfirmed as to whether it returns if you frighten it off. To my knowledge, you only get one shot, so you want to be very prepared before you attempt this. Once you’re ready, crouch and start moving towards the area, using Eagle Eye (L3 + R3) when possible to spot heat signatures from afar. Once you find it, you want to slowly get in range of the White Arabian until you can hold L2/LT to focus on it. Now that you’re in focus, you’ll notice the calm bar in the bottom right corner, which you want to keep as full as possible. Basically, hammer Square/X to make sure the horse is ok with you approaching it. Every time you see the calm bar deplete (this will usually coincide with the horse making noise and moving erratically,) you want to stop dead in your tracks and keep calming it until everything returns to normal. Keep doing this and edging closer until you’re within range to pet the White Arabian. When this happens, do this a couple of times and then press Triangle/Y to mount the horse. Unfortunately, it’s not over just yet. The horse will naturally start bucking and attempt to throw you off. What you want to do is hold the left analogue stick in the opposite direction to which the White Arabian is attempting to pull you. Basically, resist like you would when you’re trying to catch a fish, but keep hammering Square/X to calm it as you do this. Eventually, the bar in the bottom right will hit rock bottom and you’ll have broken in the White Arabian. Congratulations, you now own the best horse in the game. All you have to do now is go to your current horse, remove its saddle by holding Right on the D-Pad and place it on your new steed. Now you can bond with it and customize its kit to make it even faster. Make sure to whistle on your way out of the area so that your previous horse follows you. This makes sure it won’t be left in the cold and you can stable it just in case you lose this one. As of writing this article, we do not know of any other appearance of the White Arabian in-game, meaning you better carry some Horse Revivers to ensure it doesn’t shuffle off this mortal coil, or you won’t get anything quite as good ever again. Safe travels! Looking for more freebies? Then why not check out video below for information on how to get a free gun in Red Dead Redemption 2.